Makes for an incredible presentation that will fool your dinner party guests into thinking you’re an innovative and accomplished chef! 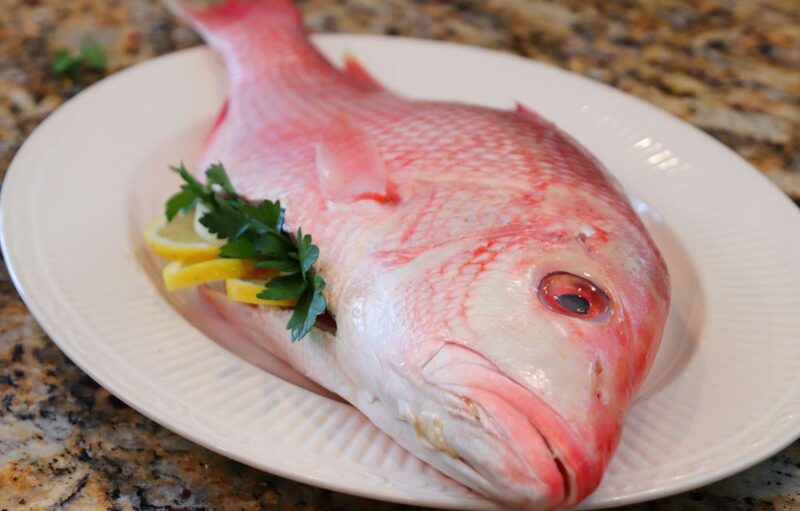 HINT: Use a firm, white fish like red snapper or branzino; if one large whole fish isn’t available or if you just prefer to mix things up, you can use 2-3 smaller fish. 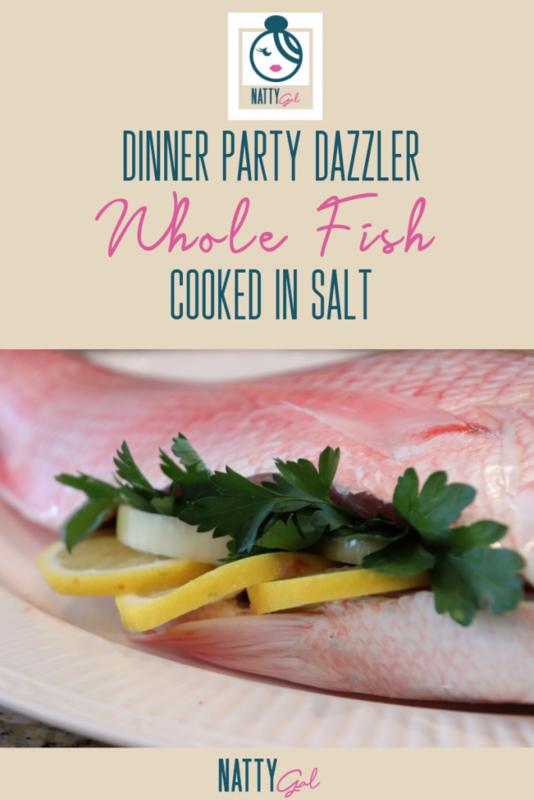 A whole smaller fish per guest could also make for a memorable meal. HINT: Use boxed eggs whites for quicker, cleaner preparation! 2. Stuff fish with lemon, onion and parsley. 3. In a large bowl, mix together the kosher salt and egg whites until mixture resembles wet sand. NOTE: I was nervous about the fish not being fully encased so I actually used about 50% more salt/egg mixture than the recipe stated. 4. 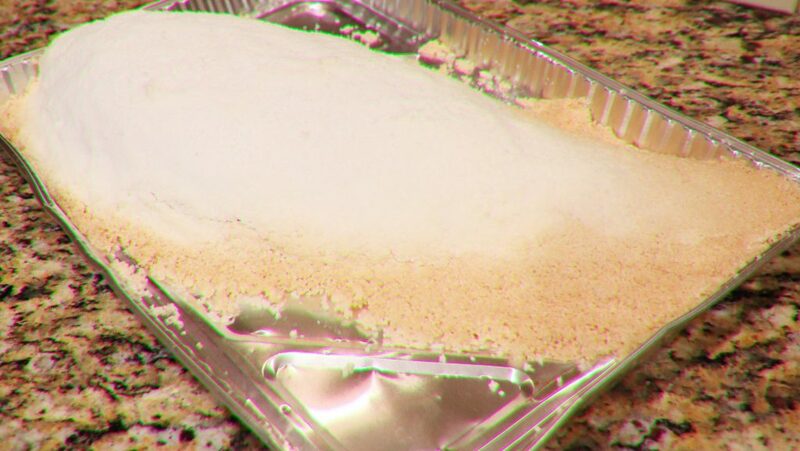 Spread some of the mixture on the bottom of a large baking sheet to create a “bed” for the fish. Lay the fish on the bed. 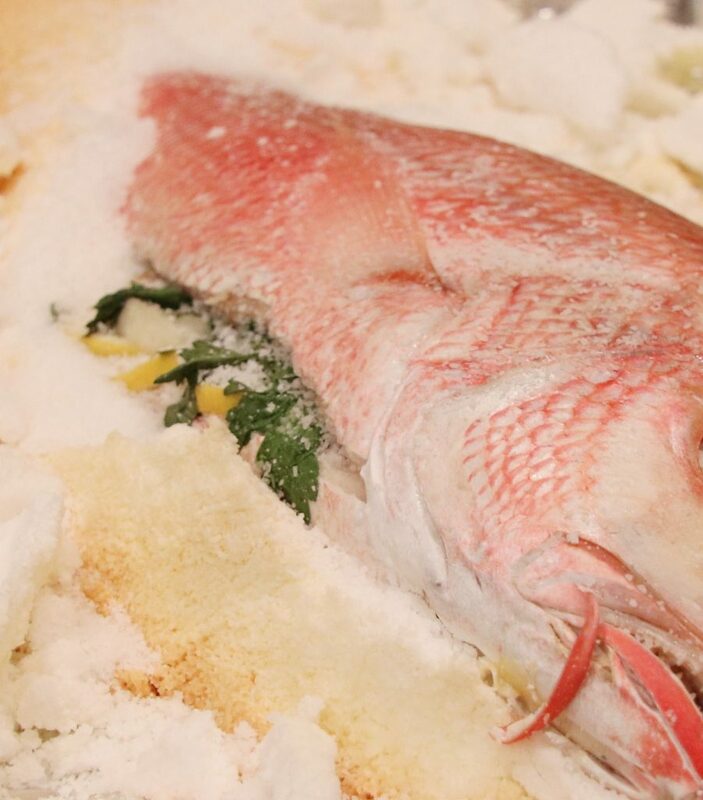 Use the rest of the salt mixture to completely coat the fish, gently pressing down. NOTE: Excuse the cooking tray, I didn’t have a sheet or pan large enough to accommodate this full 3 pound fish so had to use a disposable. Really packing this baby in – wanted every inch of him fully encased. Fish? Where’s a fish? I don’t see any fish! 5. Bake fish for about 30 minutes (or until fish has an internal temperature of about 135 degrees). Remove from oven and let cool slightly, about 5 minutes. 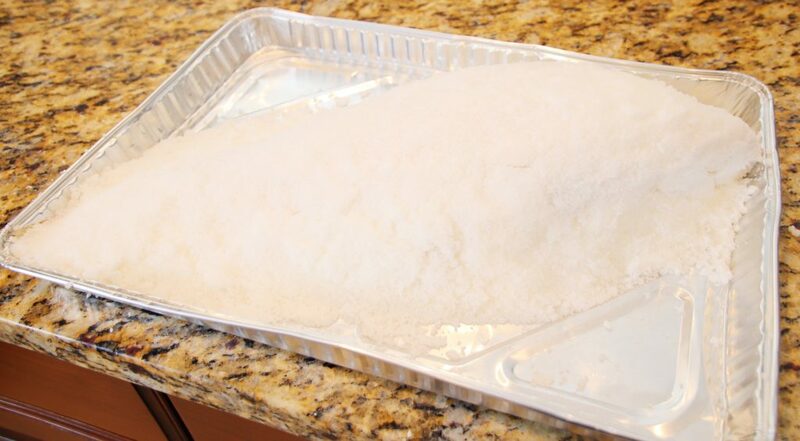 When done, the salt should be browned at the edges and small areas may show cracks. 6. 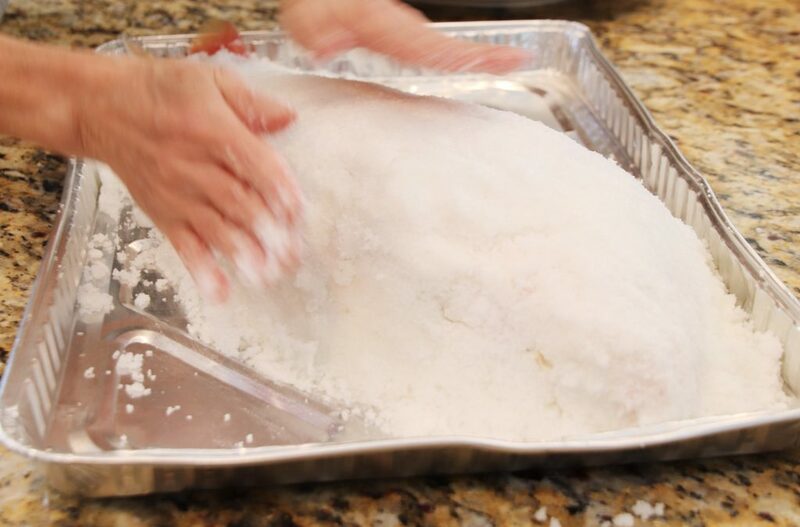 Use a mallet or the back of a heavy spoon to crack the salt coating away from the fish. This is fun – have your guests join in! 7. Serve fish as is or remove the skin and fillet before serving. With this cooking preparation, removing both the skin and bones is very easy, they’ll separate from the fillet pretty naturally on their own. 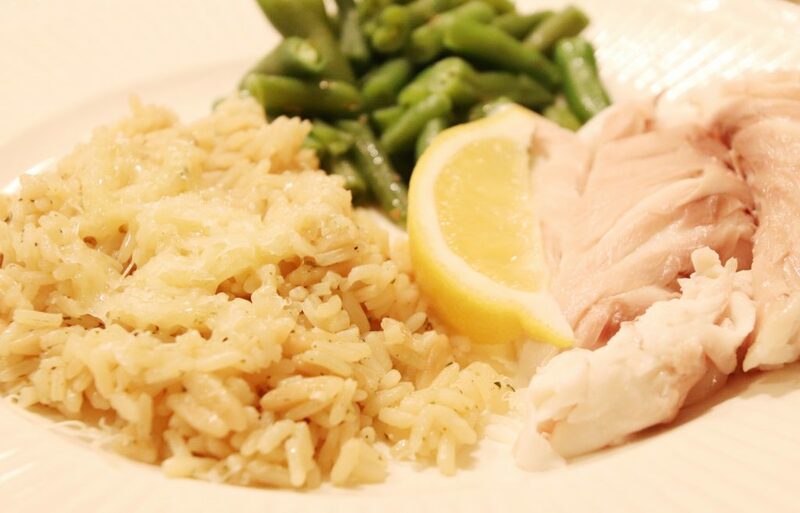 For this meal, I paired the red snapper with a simple rice pilaf and green beans, garnishing with a lemon wedge. Simple and delicious. Bon Appetit, friends! Until next week…keep it simple, keep it stylish, make it satisfying. I live in a land-locked state, so good, fresh ocean fish is hard to come by. Heck, even trout is hard to come by where I live, and that’s a river fish! This does look like a nice recipe. We have the same issue in Ohio but the company I turned to for the snapper scored a beauty! Lucky to have them. Akismet thought my comment was delicious. I blathered out some thoughts about fish and living in a land-locked state. I saw this on housewives of Beverly Hills, and I had Never seen it done like this before. Great informative, I am not much of a cook since we became empty nesters but you never know. Thanks! Hope you give it a try. It’s super easy! What an easy recipe! Even I can totally do this! Now I just need to plan a party! Can you use this recipe with a salmon? It is SO easy! 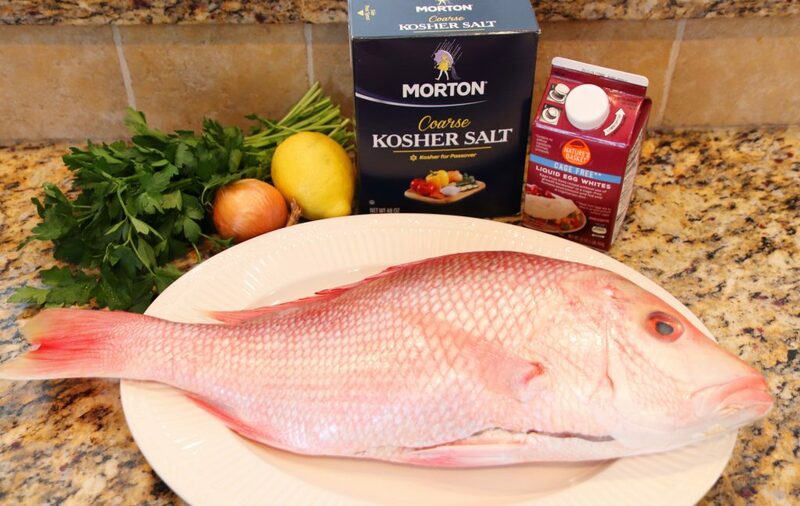 From what I’ve read, most sources seem to say that denser, fattier fish like salmon or tuna fish not work as well with this method Red snapper is really one our favorites. I never cared as much for white fish until I tried it and now I’m hooked! Hope you will be as well.